As part of its long-standing commitment to environmental stewardship, Port Tampa Bay (PTB) is pleased to announce the annual migratory bird nesting season in Tampa Bay. The official bird nesting season is April 1 through August 31, each year. The port authority works very closely with its key partner, Audubon Florida, as well as state and federal regulatory conservation agencies in Florida, to provide protection annually for nesting birds and their young in the Hillsborough Bay area. The port owns and operates two dredge disposal islands in Hillsborough Bay—islands 2D and 3D. 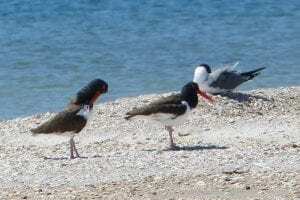 Both islands and the Richard T. Paul Alafia Bank Bird Sanctuary, have been recognized collectively by BirdLife International and the National Audubon Society for their glo bal significance as bird nesting areas. Protection of the nesting birds that use these islands has evolved into a shared project. On December 28, 2016, the port issued a letter of support to the Florida Fish and Wildlife Conservation Commission (FWC) for modifying the Critical Wildlife Area (CWA) designation of the Alafia Bank Bird Sanctuary to include the eastern island known as Sunken Island, as approved by the PTB Board of Commissioners. This modified CWA designation was officially approved by FWC in November 2016, which includes a 100-foot protection buffer and year-round no entry. Islands 2D and 3D and the Alafia Bank Bird Sanctuary are designated as “no trespassing” areas year round, and birds that nest in these areas are protected under the Migratory Bird Treaty Act of 1918, as well as the Florida Threatened and Endangered Species Act of 1977. Port Tampa Bay and Audubon Florida urge cooperation from the boating public in complying with the law and obeying these “no trespassing” designations, to allow nesting migratory birds in Tampa Bay to raise their chicks without disturbance. “Closing these areas year round ensures these birds invaluable protection from significant disturbances during the nesting and migrating seasons,” as stated by FWC staff. “Port Tampa Bay is proud of its long-standing commitment to the health and integrity of natural life in Tampa Bay. We recognize the continued need to be engaged in partnerships that ensure the quality of our local waters and related habitats,” Paul Anderson, Port Tampa Bay president and CEO, said. Audubon is dedicated to protecting birds and other wildlife and the habitats that support them. Its national network of community-based nature centers and chapters, scientific and educational programs, and advocacy on behalf of areas sustaining important bird populations engage millions of people of all ages and backgrounds in conservation. For more information, visit audubon.org or fl.audubon.org. Port Tampa Bay administers one of the largest and most diversified seaports in the United States and maintains a significant role—working closely with key partners—in contributing to the environmental sustainability of Tampa Bay. Handling a diverse cargo base, the port is also a ship building and repair hub and one of the nation’s major cruise home ports. For more information about Port Tampa Bay, the largest port in Florida and the largest economic engine in West/Central Florida, visit www.porttb.com. For fun outdoor activities in Tampa Bay consider reading this story.